During the Fall season, a colorful leaf design was created and placed alongside a waterfall in Lake Superior Provincial Park in Ontario, Canada. As a waterfall along the Sand River in Lake Superior Provincial Park in Ontario, Canada rushes by, an array of leaf colors were collected and laid out in a pretty design atop the rocks. The colors of Fall in Lake Superior Provincial Park are beautiful and each leaf has its own time span for a full color change.Fall leaves beside a waterfall along the Sand River, Pinguisibi Trail, in Lake Superior Provincial Park, Great Lakes, Ontario, Canada. Make sure to see all our pictures of the colorful season autumn. 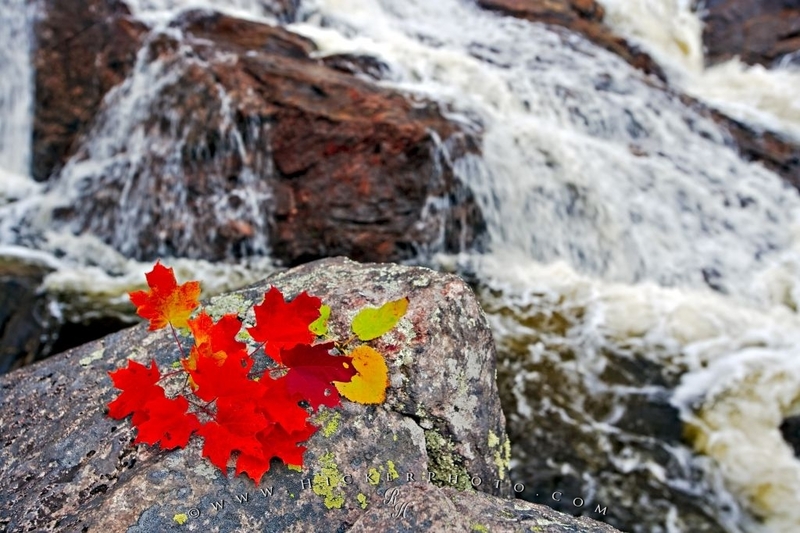 Photo of a Fall leaf design beside a waterfall along the Sand River in Lake Superior Provincial Park in Ontario, Canada.